An alleged payment of Rs 12,000 to the aggrieved family has reportedly resulted in the cover-up of the death of a 4-year-old girl in an accident the Sahnewal-Doraha road near this village two days ago. A man was allegedly poisoned to death by his relative, her paramour and two accomplices in Dr Ambedkar Nagar here last afternoon. Bickerings had been going on in the family for the past three days. The victim, Suman Singh was allegedly kidnapped by the accused on Thursday last. 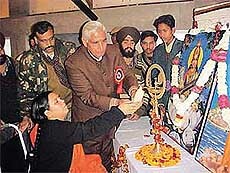 The Union Minister for Sports and Youth Affairs, Ms Uma Bharti, today asked the Pakistani President General Pervez Musharraf to implement his promise to hand over to India those terrorists, who, at present had been provided asylum in Pakistan, to prove that he really wanted peace in the subcontinent. Local residents feel that politicians, to get elected by people, to become their representatives, try to lure them by distributing liquor, poppy husk, opium and other drugs among them to get their votes instead of getting these on merit. The family of Jangir Singh, who died recently at the age of 80, after a brief illness, has set an example before others by donating his eyes to the Eye Bank, Mansuran. The family, belonging to Kalsan village, near Raikot, was motivated towards this noble cause by Mr Ishar Singh Nathowal, a social worker, who actively campaigns for eye donation in the area. The Additional Sessions Judge, Mr G.S. Saran, has dismissed an appeal of the Improvement Trust, Ludhiana, against an order passed by Additional Civil Judge, Mr A.K. 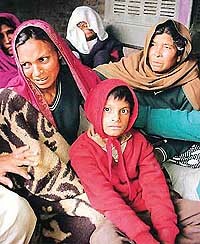 Mehta, on November 22, 2000, in which the appellant was restrained from changing the use of land reserved for a community centre at the Model Town Extension. Barring the BJP, which is yet to name its candidate for the Ludhiana North Assembly seat, the Congress, SAD and The Panthic Morcha have released the names of their respective nominees for the Assembly segments in the district. 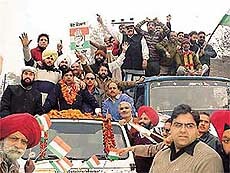 The DCC (urban) president, Mr Surinder Dawar, Congress nominee from Ludhiana East, being given a warm welcome by his supporters at Sherpur Chowk on his return to Ludhiana from Delhi on Sunday. The police has booked four persons under Sections 406 and 498-A of the IPC on the complaint of two sisters who have alleged that they are being harassed by their in-laws for dowry. In the current Indian scenario of intense competition, there is an increasing need for outsourcing products and services. The CII-UNIDO Indian sub-contracting and partnership exchange (SPX) programme helps to promote efficient buyer-seller contracts and assist vendors and sellers in meeting needs of the buyer in competitive manner, said Mr R C Bhargava, Senior Consultant-UNIDO and Coordinator, SPX. The Everest Model School, Mundian Kalan, held its annual prize distribution function yesterday. Mr Akhtiar Singh was the chief guest. Mr Tara Singh, Field Publicity Officer, Ministry of Information and Broadcasting, was the guest of honour. Students of Everest Model Senior Secondary School present a group song at the annual function of the school in Ludhiana on Saturday. The local Bharatiya Vidya Mandir Senior Secondary School held its prize distribution function in the school auditorium yesterday. Mr Brahmdev Sharma, Akhil Bhartiya Shiksha Sansthan, was the chief guest. Bankers and the unwitting defaulters could not have asked for a better opportunity to settle cases than the first-ever special state-level Lok Adalat held here today, where 800 pre-litigative cases worth crores of rupees were settled on the spot, without any litigation fee or legal hassles. Deputy Commissioner S.K. Sandhu has asked Returning Officers (ROs) of different constituencies and police officials concerned to keep constant liaison to ensure free and fair elections and to implement the model code of conduct.